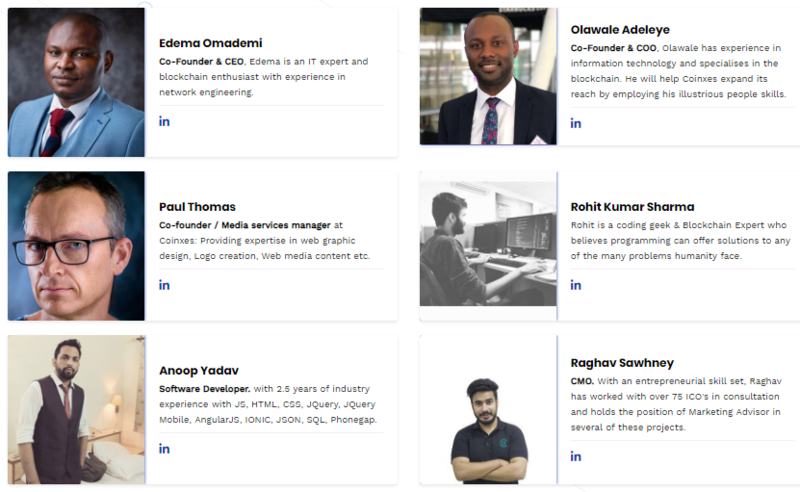 Coinxes platform is a digital exchange that allows users to buy and sell cryptocurrencies from anywhere in the world. Unlike your average exchange, it boasts more features that bridge the gaps experienced by users registered in other exchanges. For instance, Coinxes is fully decentralized, allowing users to buy and sell cryptocurrencies peer-to-peer (P2P) in a more secure environment. It is not susceptible to hackings and eventual loss of funds because client funds are not held on the platform. The vision of Coinxes is to create a platform where crypto traders can buy and sell cryptocurrencies without any restriction based on location, language, mode of payment and not being charged multiple times for deposits, trading and withdrawals. Coinxes P2P exchange link Buyers with Digital Currency Sellers. The sellers set their own price and what types of payments they will accept. Many accept PayPal, Bank Transfers, Credit Cards or cash. Coinxes P2P Exchange matches people interested in trading cryptocurrency. Create your own trade directly with another person based on the amount of cryptocurrency you want to buy or sell, your country or region and payment method. With the decentralized cryptocurrency P2P secure transactions, all payment is verified before being released from escrow. They do not store cryptocurrency. As a result, there is no fear of hacking, resulting in a safe environment for your digital assets. Buyers and sellers agree on terms of trade by setting their own price, the volume of trade and the types of payments they want to accept. Cryptocurrency is kept in escrow accounts and released when payment is verified. At Coinxes P2P Exchange, they do not charge withdrawals fees. The P2P exchange site offers high resistance to transaction censorship and is private, secure and cheap to use. Coinxes provides the fastest and easiest way to buy and sell cryptocurrency locally, with a reputation-based system and arbitration. Decentralized cryptocurrency P2P site, with secure transactions as all payment are verified before being released from escrow. Coinxes does not store cryptocurrency. As a result, there is no fear of hacking. Create your own trade based on the amount of cryptocurrency you want to buy or sell, your country or region and payment method. Trade Bitcoin, Ethereum, Neo and Litecoin on this platform. Want your money quick? Coinxes P2P Exchange makes the payment process automated, now you don’t have to wait for days to receive your Crypto Currency or Money from your buyer. Make the transaction through Coinxes and it will be completed in minutes. As you are using P2P, only limited information will need to be passed through our site so that your money can be transferred securely. Because you are connecting to another person via P2P on the Coinxes site, your transactions are made in a private and secure way that gives you peace of mind. Can use Cash or any payment method the seller / buyer is willing to accept Online transactions are fast and safe as cypto currency are protected in escrow accounts You receive your currency instantly -upon receipt of payment. P2P transactions mean you are connecting directly with other digital currency or cash owners to share digital content. There is no central server, just distributed “nodes” sharing information and files. If one server goes down then your transaction is secure as it does not reside on one server, rather distributed over the network. 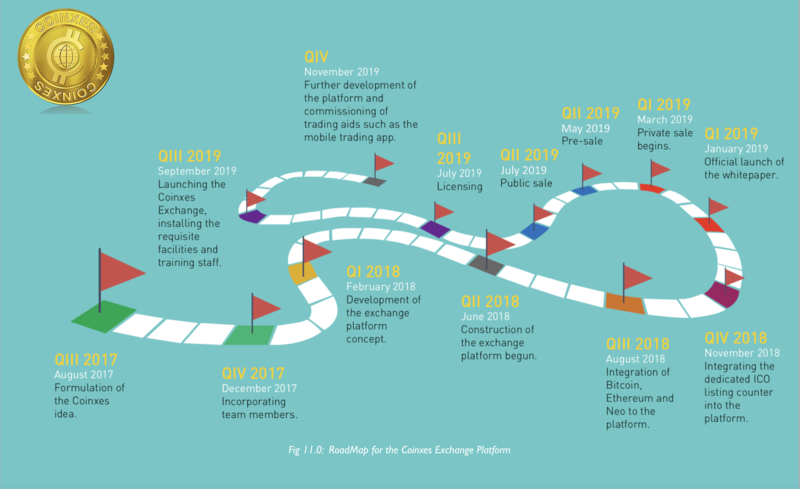 The Coinxes platform will perform ICO during Q1 2019. During the practice of making these tokens, the platform will produce a total of 180,000,000 CXG. 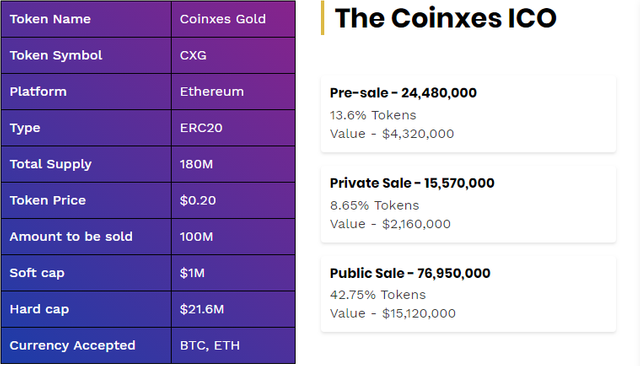 Coinxes will order 19% (34,200,000 tokens) with the remainder approved to the public during pre-sales, private sales sessions and three phases of public sales.